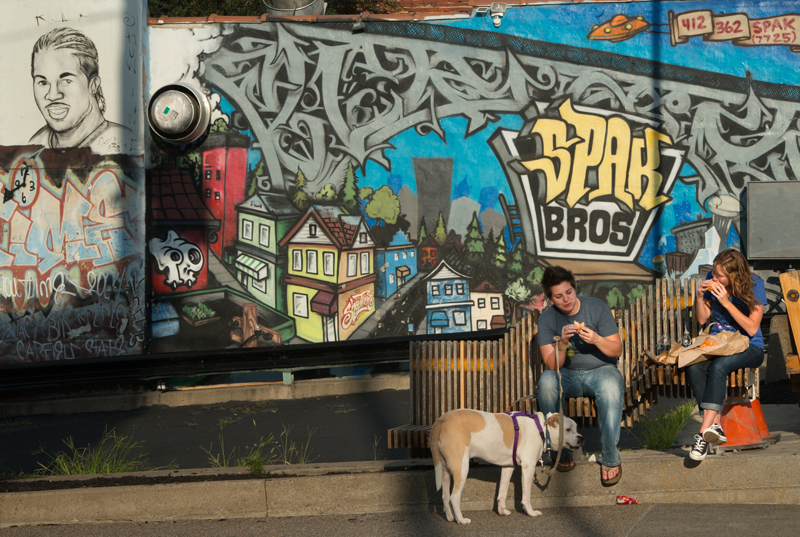 As Unblurred: First Fridays on Penn Avenue gets under way, Jennifer Ross (L) and Julie Crutchman enjoy hoagies from Spak Brothers, accompanied by their dog Auggie. Geoffrey Morgan and Krystyna Pawlowski practice waltzing at Los Sabrosos Dance Company. Los Sabrosos means "the flavorful." 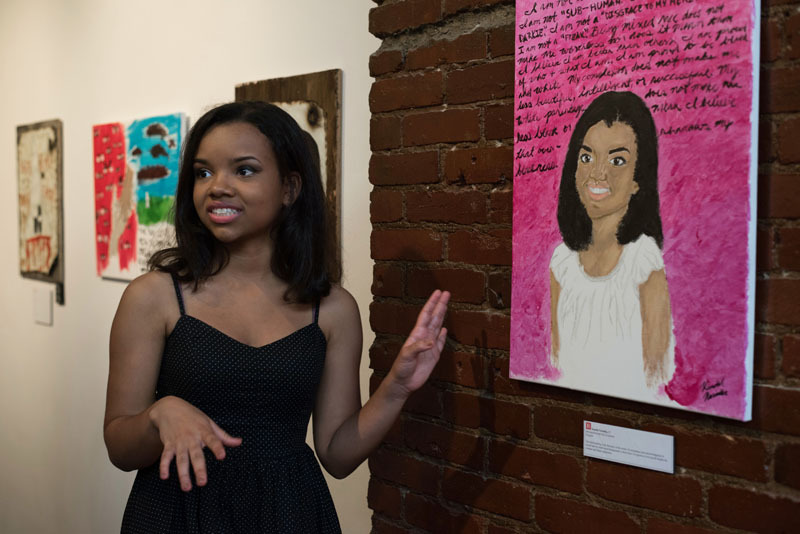 Kendal Nasiadka, a senior at Oakland Catholic , explains the motivation behind her self-portrait. The painting is in the exhibit 'Adopting Identity: The Exploration of Lies, Luck and Legitimacy' at Most Wanted Fine Art. 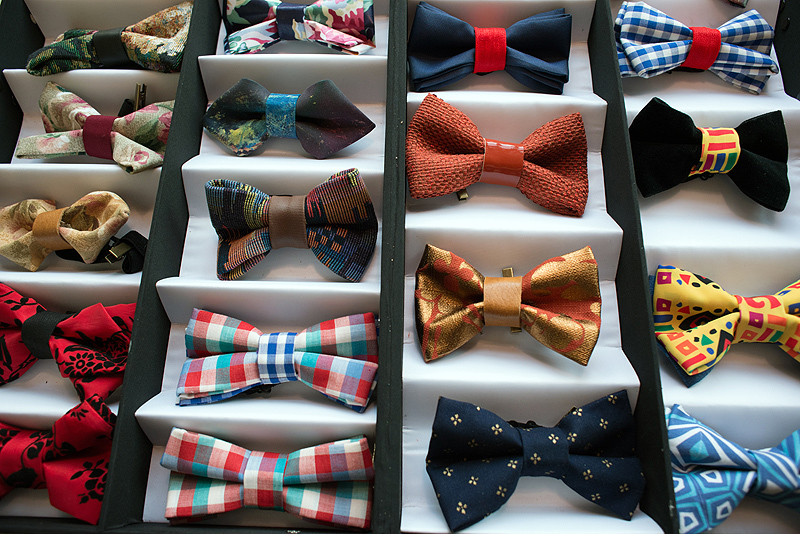 Upcycled bowties created by Pittsburgh artist Nisha Blackwell, for sale at Fieldwork Contemporary Gallery. Blackwell sells her artisan ties on knotzland.com. 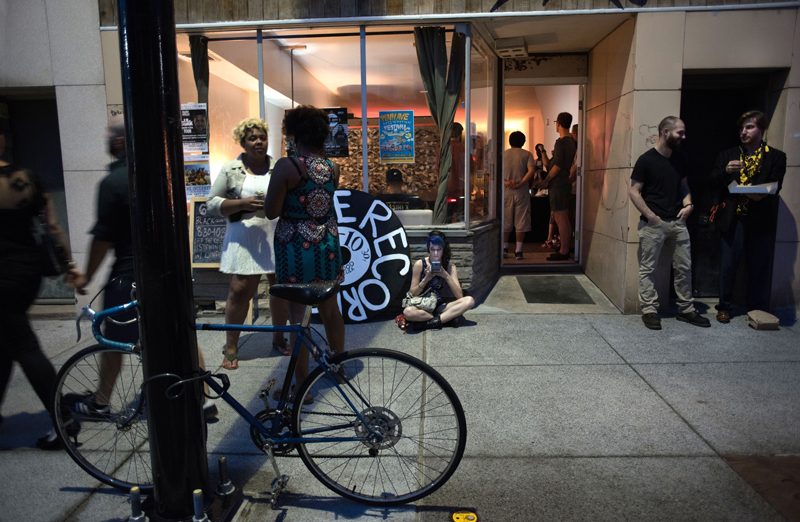 As night falls and the temperatures begin to cool, Pittsburghers gather on Penn Avenue to converse and gallery-hop. 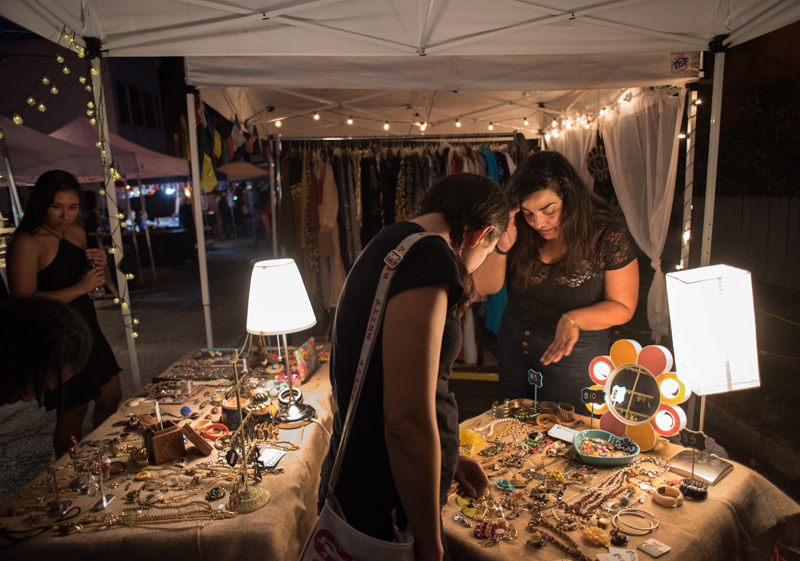 Marigrace Ambrosia (R) shares the story behind her collection of vintage jewelry for sale in a popup booth at the Garfield Night Market. Ambrosia and her colleague Sara Ponsoll are founders of Kitschtopia, an online vintage fashion store. 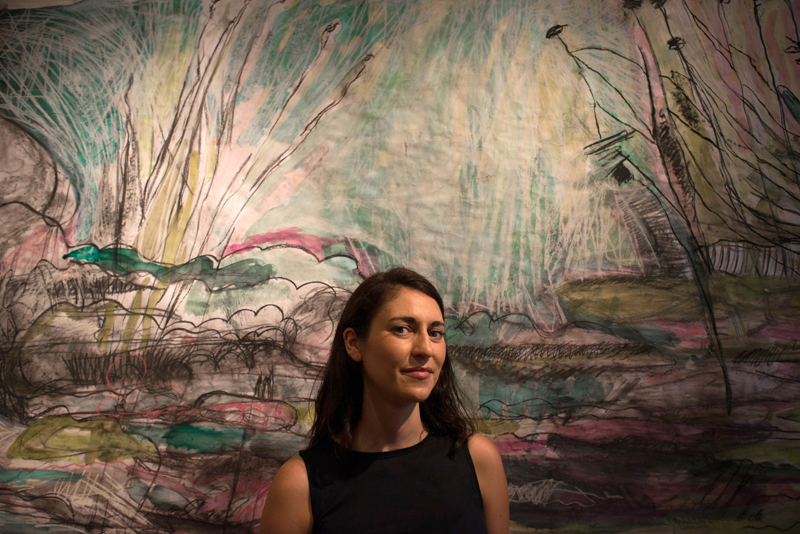 Artist Sarah Zeffiro with her mixed-media work "Wading" at Fieldwork Contemporary Gallery. Fieldworks hosted a show called 'Makers & Music' at Unblurred. 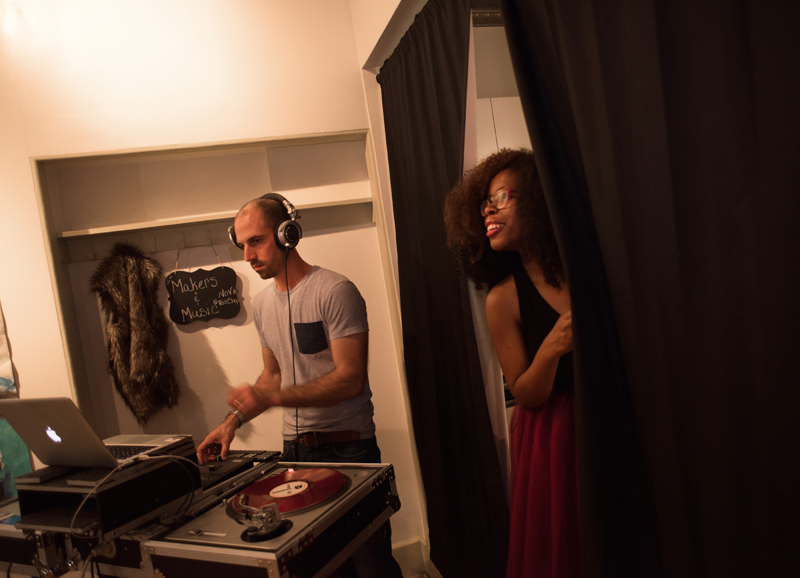 Here, Tanisha Jackson (R) watches from backstage while Dj Illeso gets down to business. 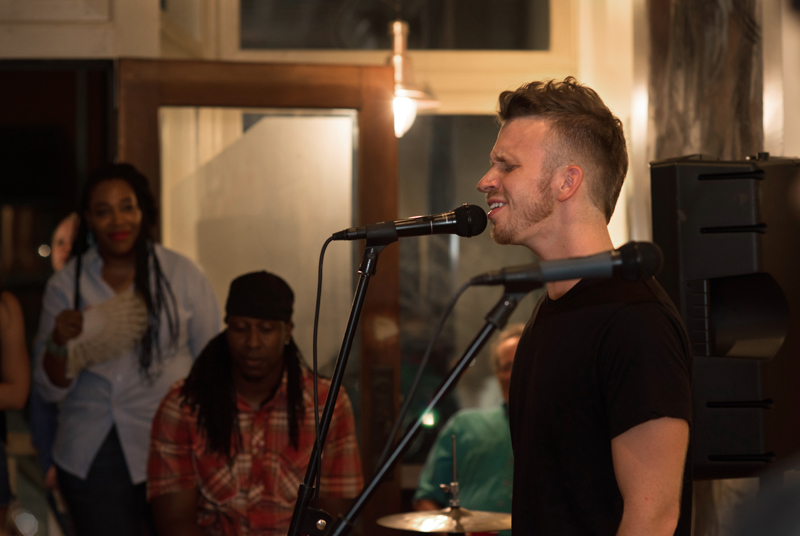 Soulful singer Aaron Pfeiffer was visiting his hometown over the weekend and offered to perform at the Fieldwork show. He now lives in New York City and recently released his debut single "Can't Shake This." 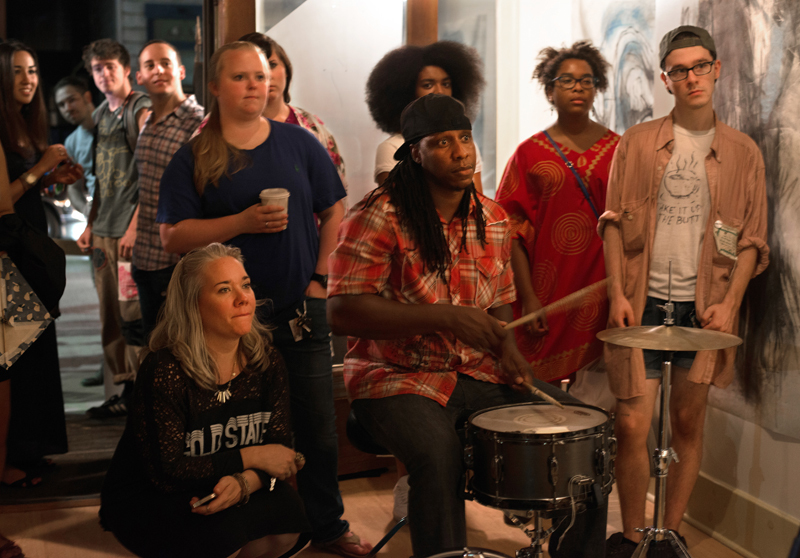 Fans and friends of Aaron Pfeiffer began to crowd Fieldwork Contemporary Gallery when they learned he was back in town and performing at Unblurred. Please Click Photo to Start Slideshow. Martha Rial is a Pittsburgh native and a Pulitzer Prize-winning photographer.